It’s just another New York story of boy meets boy, boy breaks up with boy, boy gets depressed, works in the basement of a funeral home, drinks too much, wakes up in a strange bed, dates a crazy person, and still makes it to brunch in time to tell the tale. 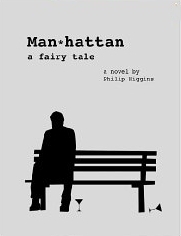 Man*hattan: a fairy tale by Philip Higgins is not your typical m/m romance. Though the story abounds with the Manhattanite stock bitchy gay characters, they are not there just to fill out the life of Michael, the nervous, emotionally uncertain narrator. They are at once surface-familiar and yet at odds with expectations. It is the narrator’s sense of awareness and detail, and gutsy sense of humor that brings this story to life. His emotional vicissitudes steer the story away from the normal romantic paths toward something much more interesting. Anywhere a lesser writer would have inserted a romantic/sexual interlude, Mr. Higgins strikes out in a different direction, especially in the ‘romantic’ interludes. Mr. Higgins attention to detail does not bog down the story, rather is used to give insight and emotional heft to the narrators state of mind, and to lift the story above being just another slice of gay urban life rom-com. Man*hattan: a fairy tale is a well-written book by a new writer with a bold and interesting point of view.